Watching a movie (and particularly the ‘film of the book’) rather than reading a novel was once widely regarded by university English departments as a soft option, a kind of mental slumming. Eighteenth-century gentlemen, at least, might have had similar reservations about reading anything as trivial as a novel rather than a more mentally exacting philosophical treatise, or culturally significant essay in natural history. Their choice was perhaps made simpler, however, by the fact that most current scientific knowledge was still comprehensible to the layman, while fiction did not yet have such literary heavyweights as Proust or late James. Today, the same English departments may be teaching cultural theory or women’s studies and will certainly no longer be questioning the legitimacy of different narrative media. Urban graffiti, if politically correct, may rate higher than an ideologically reactionary epic. 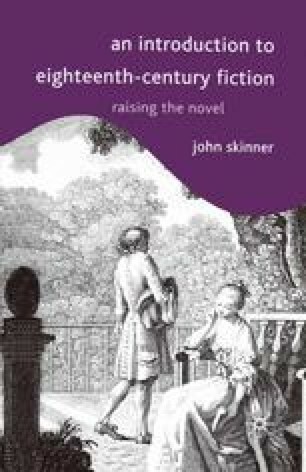 Similarly, the children (and above all the grandchildren) of those eighteenth-century gentlemen probably possessed handsome bound sets of the same lowly novels, as fiction became increasingly respectable and institutionalized.